At the dawn of America’s love affair with the automobile, cars and trucks leaving the nation’s largest city were unceremoniously dumped out of the western end of the Holland Tunnel onto local roads wending their way through the New Jersey Meadowlands. Jersey City mayor Frank Hague—dictator of the Hudson County political machine and a national political player—was a prime mover behind the building of the country’s first “superhighway,” designed to connect the hub of New York City to the United States of America. Hague’s nemesis in this undertaking was union boss Teddy Brandle, and construction of the last three miles of Route 25, later dubbed the Pulaski Skyway, marked an epic battle between big labor and big politics, culminating in a murder and the creation of a motorway so flawed it soon became known as “Death Avenue”—now appropriately featured in the opening sequence of the hit HBO series The Sopranos. 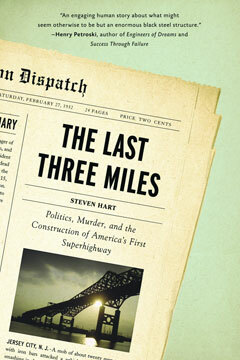 A book in the tradition of Robert Caro’s The Power Broker and Henry Petroski’s Engineers of Dreams, The Last Three Miles brings to vivid life the riveting and bloodstained back story of a fascinating chapter in the heroic age of public works.